When I first tasted the 2001s from barrel in late 2002, I described them as “scented, stylish midweight Pinot Noirs with the lightness of touch, tension and aromatic complexity no other part of the world can duplicate.” Fifteen years later, they are perhaps a bit less refined but somewhat sturdier than I originally believed, and even though virtually all of them are ready to drink, I was pleasantly surprised by how slowly they are evolving. This progress report on the ‘01s at age 15 is based entirely on bottles that were opened for me by the producers during my visits to Burgundy in November and December. In other words, I did not have the opportunity to taste the 2001s in peer-group tastings. In nearly every case, bottles were simply uncorked and poured (i.e., not decanted), which is almost certainly the way I would have tasted these wines had I conducted group tastings in my own dining room. As a rule, the 2001s show lighter and/or more advanced colors than the 2002s did a year ago. Two thousand two generally boasts greater retention of fresh fruit character while the 2001s show more earth tones, not to mention tertiary notes like dried fruits, leather, mushroom, fig, tobacco, cigar box, coffee and nuts. They are generally farther along their arc of maturity than the 2002s, which, though expressive on the nose last year, were frequently quite youthful in the mouth. Still, at the level of the wines the producers chose to show me, the 2001 vintage remains full of life. March was rainy and the spring featured moderate temperatures. The flowering was then drawn out by cool, rainy weather in early June, which planted the seeds for irregular ripening of the grapes. There was also the potential for a fairly large crop that would require green harvesting. July began cool and wet but turned hot during the second half of the month. The first three weeks of August were also quite hot, with a couple of major storms, including a severe hailstorm on the evening of August 2 that devastated much of the Volnay appellation and also affected some adjacent parcels. The weather then turned cloudy and cool again in late August and the first ten days of September (with nighttime temperatures twice descending to the low 40s in early September). The ban de vendange, the “official” legal starting date for the harvest traditionally set by the local authorities (but discontinued in 2008), was September 17 for the Côte de Beaune and the 20th for the Côte de Nuits. But except where yields were very low, not a lot of fruit was ripe enough to pick by then, as the inclement weather in early September had made it difficult for the late berries to catch up. Some estates, worried about the possibility of more rainfall, picked too early. Others waited as long as another week to start but were bedeviled by some precipitation, mostly at night, during the week of September 24. (I should note that 2001 was a year in which France's weather forecasters went on strike in September, which complicated harvest planning for many properties.) Some growers reported that the ripeness eventually came quickly in late September, along with spreading rot, but others had already finished picking. Later harvesters who were able to avoid rot benefited from greater phenolic ripeness, which allowed them to make deeper, denser wines with riper tannins. Still, even growers who had carried out strict green harvests to reduce crop loads and eliminate less-ripe grapes often had to live with a wider than ideal range of fruit maturity. 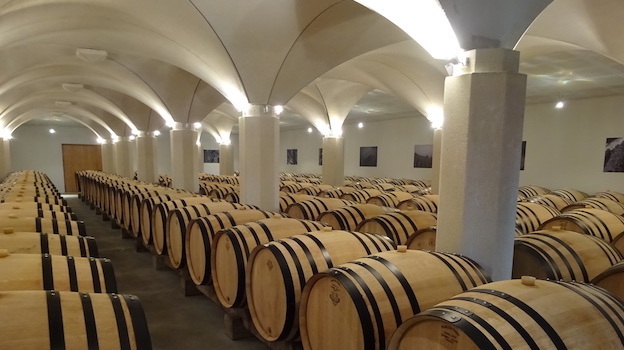 Growers on the Côte de Nuits were much more likely to have been able to take advantage of the clement late-season weather than those on the Côte de Beaune, who had finished earlier. Rainfall totals during the summer were also higher in the southern portions of the Côte d’Or than they were farther north. Crop levels in ‘01 were large but rarely excessive. Strict sorting of the grapes was essential, although this was done more to get rid of underripe grapes than rotten ones. In Volnay, it had been necessary to eliminate hail-affected grapes in August but, even so, the ripening process was compromised in many vineyards touched by the August hailstorm. On the whole, grape sugars in 2001 were average by the standards of the time, mostly ranging between 11% and 12% and requiring chaptalization. Some growers voiced concerns about the dry edge shown by some of their wines owing to the imperfectly ripe skins. With so many overcast days in the weeks before the harvest, they reported, there was simply not quite enough photosynthesis. Levels of malic acidity were generally high, especially in wines from growers who were not in a position to let their fruit hang in September for greater ripeness, but some winemakers noted that the high malics facilitated extraction during vinification. But some wines were overextracted, with the result that their tannins were out of whack with their underlying density of material, or slightly green or harsh due to incomplete ripeness of the grape skins. Some winemakers carried out a saignée (bleeding off a portion of the juice) to concentrate their musts, but this process can throw off the balance of a wine, accentuating its tannins or its green elements if it’s not done judiciously. As a rule, 15 years ago most estates were also doing more frequent punchdowns of the cap than they are today, and this is also an extractive technique. I recall many growers telling me in November of 2002 that the ’01 reds were rather unpleasant to taste early on. The malos were long, owing to the high levels of malic acidity in the grapes and to the cold, early winter of 2002, which chilled the cellars. But the wines softened dramatically after the secondary fermentations. As a rule, at the outset the 2001s showed clearer terroir character and greater complexity than the 2000s: they were less simply about fruit, although it must be pointed out that many 2000s are delicious and alive today. I was pleasantly surprised by the purity shown by many 2001s I tasted last fall, and I was rarely put off by underripe or harsh tannins. As a rule, the mostly medium-bodied 2001s are more evolved and less glossy and refined than the 2002s are, and it’s only the exceptional ‘01 that still shows much primary fruit character. Still, I was encouraged by the longevity of the better wines I tasted. While virtually all of the 2001s I tasted can be enjoyed now, many still have useful years—and perhaps further positive evolution—ahead of them. As you might expect, stocks of older wines—especially those from desirable vintages—are low among the mostly elite producers I visit each year; some had only magnums to show—or preferred to show magnums—while a couple presented 375-milliliter bottles. I have made the bottle format clear in my notes.